It is very important that you attend and show the strength of economic development in Iowa. Join us for the 2019 PDI Legislative Showcase (in conjunction with the Travel Federation of Iowa – TFI) YOU MUST BE REGISTERED TO ATTEND!! Held at the Iowa State Fairgrounds on Wednesday, February 6, 2019 – 5:00-7:30 pm. 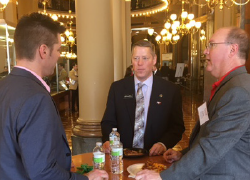 This coordinated event has a greater impact and provide PDI's members with a better opportunity to visit with legislators. This is an evening event with food/beverages, and tons of information about economic development and tourism. The 2019 PDI Legislative Agenda is being rolled out now! Check out the attached brochure that will focus PDI's legislative efforts for the upcoming session. PDI will communicate our legislative agenda with one Email blast each week for six weeks prior to February 4. PDI will send out a mailing to all legislators with our 2019 agenda and a personal invite to the PDI's Legislative Showcase. The Legislative Committee has talking points to arm you with the ability to talk one-on-one with your local elected leaders. You may want to consider being a sponsor this year. You can receive benefits for all PDI events or choose any three out of four events that PDI has slated for 2019 including the Legislative Showcase.